Dante’s vision of the creator as the symbol of the three rings of the source of creation. Illustration by Gustave Doré. Public domain image found here. Throughout time, practitioners of the ancient Religion of the Sun used specific symbols to incorporate the message of their spiritual practice into their lives and culture, and to convey and carry this message all over the world. A new resource has just been added to The Spiritual Sun featuring many of these ancient symbols, their meaning, and some examples of how and where they have been used throughout time. This resource is a work in progress, featuring only a few symbols to start with, but more will be added in the near future and updates will be posted whenever new symbols make it to the page. ~ The three rings symbol, which is a symbol representing the source of all creation, the three primary forces and the cosmic Trinity of Father-Mother-Son/Christ. An example of how ancient symbols can be incorporated into jewelry, clothing, ceremonial items, etc. This custom made pendant features the double spiral symbol. ~ The astronomical sun symbol, which is actually an ancient symbol of the sun corresponding to the two inner rings of the symbol above — the union of Mother (outer ring) and Father (inner ring). ~ The infinity symbol, which is a symbol of the equinoxes, and which represents the cycling nature of the cosmos and of life. ~ And the double spiral symbol, which tracks the sun’s journey through solstices and equinoxes, and which represents the cosmological relationship between the sun and the earth. Featured photo of Newgrange spirals is by Nomadtales, by [GFDL or CC-BY-SA-3.0], via Wikimedia Commons. This is a really great resource, thanks very much for putting it together. It is incredible to see so many cultures using symbols of the religion of the sun. After having gone through the entire gallery it has really helped to be able to identify other possible ancient uses of sun symbols. 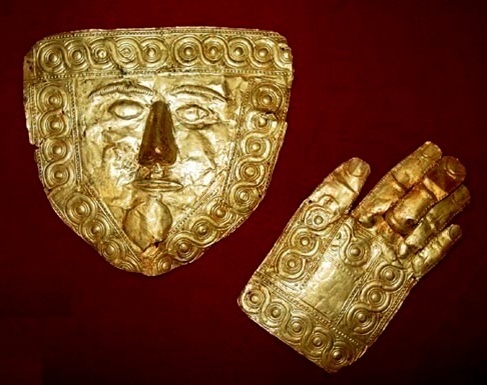 For example today I came across the 5th to 6th Century BC golden funeral masks found at Trebenista in Macedonia and was immediately struck by the sun symbols on them such as you can see here, here, and here. It was interesting to note too the old and new Macedonian flag is a depiction of the sun. These masks are really nice, David — very interesting. 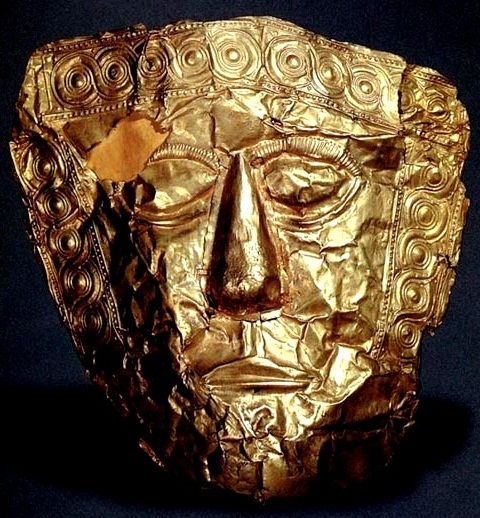 Remind me a bit of the artistic style of the golden “hats” with symbols of the sun and other similar ancient art from Europe (featured in the “astronomical sun” gallery). It is really nice to have such a wide variety of examples of sun symbols and I agree that having this resource makes you more primed to see them other places. Today I saw an article about some newly discovered 4,000 year old bone ornaments (50 of them) found near Hyderabad in India. They are all diamond/ rhombus shaped, with perfectly inscribed 3-ring of creation sun symbols in the middle of each one. Those are really neat, Dara. Thanks for sharing! I just added a link to them in the image gallery. Interesting that they are shaped like a lozenge, which is another symbol associated with the Religion of the Sun. Great to see the beginnings of this resource and very much looking forward to seeing it grow as time passes. There are so many artifacts out there that are hidden away in museums (both on display and not – and continually being discovered in archeological digs), that I can see this being a never ending project. Like other aspects to the revival of the religion of the sun, it’s something brought very much alive through continual efforts in exploring and research. Thanks for starting this resource Jenny! It is great to have a well researched collection of symbols related to the Religion of the Sun. On a personal note, symbols have been a curiosity and an interest of mine for many years. I noticed that seeing symbols in daily life can bring about feelings, memories, and corresponding ways of being in me. For this reason I think symbols have a lot of power. I think that symbols are not just in art or objects, but also exist in the design of houses and cities, arrangements of objects and colors, and much more. It would be amazing to be able to interpret symbols from life, consciously understand and use their impact. I hope that with this resource we can start to understand about and bring the symbols of the Religion of the Sun into our lives. Thanks for the well presented and communicated level of information Jenny. It is great to find these details on one place, so nobody needs to search in different places. I hope this helps everyone, even those who are not technically minded, to set up a sacred circle. Thanks very much for this new resource page. I am enjoying reading up on the different symbols and their meaning. It gives a clearer picture of what the peoples from antiquity were doing and why. Great work Jenny, symbols are so timeless and powerful. Im looking forward to seeing many symbols related to the religion of the sun and there true meaning. Great resource! Thank you Jenny. It may be just the beginning but already it has helped me correct some misconstrued ideas.. For example, I felt that the unequal double spiral was a modern take on the ancient ones, yet now with thoses images and explanations (like in Newgrange for example), I can see how one side is more tightly interwined and slightly smaller than its counterparts. And I had totally missed that beforehand. I also really like the presentation,and explanations. Wonderful! Many thanks again ???? Thanks Jenny! I’ve been amazed to learn how much is within symbols recently. I’d always heard they were ‘powerful’, and I’m sure their real power still eludes me, but just to comprehend that they can be signifying the actual path of the sun, like in the case of the annalemma and the double-spiral of the year, brings a whole new level to them. I just stumbled across ‘Miami Circle’, in Florida USA which maybe looks like an astronomical sun symbol if you ask me. Google image search and you can see it. Its an ancient site with alignments. Thanks for the tip, Olga. Just looked it up quickly. I emember hearing something about this circle some years ago, but didn’t realize it’s a place people can visit — the way it was presented back then was that it was something stumbled upon during construction. Sounds like it could have been another woodhenge, like Cahokia, maybe? Interesting it has alignments to solstices and equinoxes, and by some estimates can be 1700-2000 years old. I have always been wondering about the carvings in caves. Seeing how so many ancient sites and elaborate megalithic complexes have allegedly been used as schools to teach students about astronomy, mathematics and spirituality, I wonder if that is how these caves have been used, giving mini lessons of different components about life, science and the religion of the sun to smaller gatherings of people. Wow! Great examples of how these symbols are universal and can be found in the heavens as well as in ancient cultures. Yeah, it’s looking great so far. I find this ancient symbolism and geometry very interesting – especially when it is found in ancient structures all around the world. I was watching a documentary recently on the physical and mental health benefits of Earthing (physically connecting with the natural Earth). 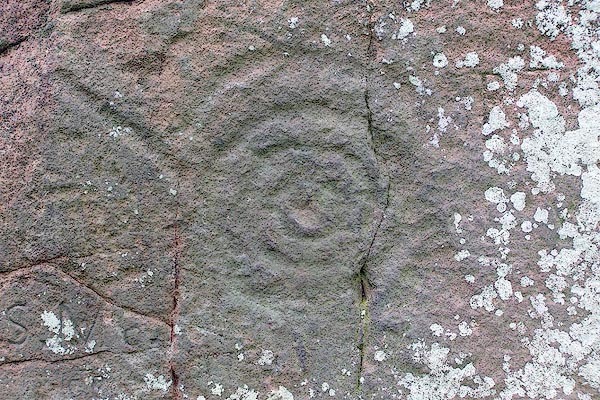 At one point they talk about these ancient circles, carved centuries ago in stone in places of spiritual significance, such as Long Meg and Her Daughter in Britain. They claim that images created in a Faraday cage of the frequency of the Earth (that occurs in the spherical cavity between the Earth and the ionosphere) is very similar in shape. Apparently all creatures on Earth, including humans, are attuned to this frequency. On a similar note, apparently Quezacoatl wore the snail/shell symbol around his neck. Following is a very interesting, well researched and reasonably brief article on this symbol and its potential meaning. For myself I find that on top of learning about symbols through historical/archaeological study and the information we have available, which is very useful and a good starting point. It’s been very good to investigate their meaning, as far as I’m able, through trying to get a feel and insights about them myself. By using them in practices (such as visualisation), in decoration, during solstice ceremonies, drawing them, and even in out-of-body experiences etc. and over time this can help with tuning into their meaning and power more. Many of these symbols are so natural and inherent to life and creation. Like the simplest ways to symbolically show principles. The spiral shell symbol is something that I didn’t really get. But what I thought I got from reading that article was that it’s great way of showing something growing. Of ‘generation’ as the article mentions. From a smaller centre expanding bigger into bigger spirals. Looking forward to reading the rest of that article. What you mentioned about the “cup mark” patterns sounds like the patterns that emerged in the cosmic microwave background of the universe in study done by Penrose and Gurzandyan (there’s a link to it in the “three rings of the source of creation” gallery for more details). I didn’t think about the connection of this pattern with the cup marks before, but it’s an interesting thought. The cup marks interest me very much as well. They seem to encode something of importance. I’ve read one very compelling explanation of the earlier versions of these cup marks by a linguist and historian Laurence A. Waddell who believed them to be a form of symbolic ancient writing, which he was able to interpret as prayers to the sun. It is a great resource and very well put together. The collection of images all in one place really brings home how widespread the use of these symbols has been. Very inspiring. This is really cool Jenny. I love being able to look through the symbols in their galleries and read about their meanings and where each was found. This is a wonderful resource! It would be indeed wonderful to actually wear or make something that carries a spiritually positive meaning rather than to wear patterns and designs that are either empty, or even harmful, as is often the case today. I also like the sliding picture gallery feature at the top of each symbol explanation – really interesting to scroll through. Thank you Jenny and everyone who helped and keeps helping to expand this unique resource! It’s really good to find out the meaning of each symbols. Brilliant idea, thanks Jenny. This is great Jenny! Seeing these symbols brought together from different cultures in the same resource makes one feel awe, how unified they used to be in their spirituality and veneration of the sun. It looks quite useful for incorporating these symbols in what we do now and having a better understanding of and feel for how they were used in the past. Thanks a lot. Amazing resource! It’s so helpful to have all these real-world examples of symbols in photos and drawings, from such a diverse array of cultures and places in the world. It really brings the symbols to life to see them in so many contexts. And having the explanations there is helpful too, this will be a very rich resource as it grows and is added to. Thanks for assembling all of it together. Thanks for sharing that Jenny, it’s an amazing resource, seeing how the same symbols have been used across many different cultures. Look forward to seeing what’s added as it grows!